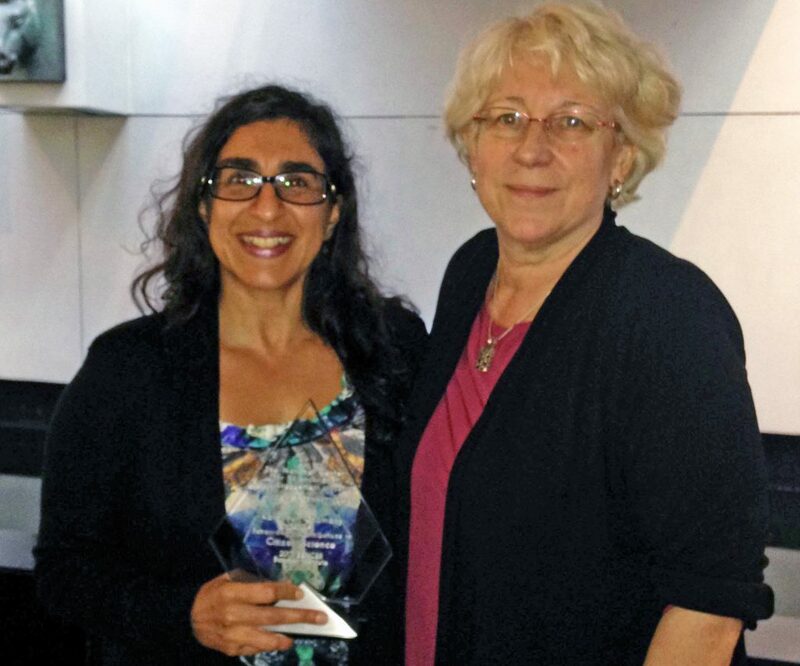 Katayoun Chamany, associate professor of biology and chair of Interdisciplinary Science at Eugene Lang College, was presented with the 2017 William E. Bennett Award for Extraordinary Contributions to Citizen Science by Dr. Monica Devanas, a past recipient of the award. As an associate professor of biology and chair of Interdisciplinary Science at Eugene Lang College, Katayoun Chamany has taught students to use scientific knowledge to address pressing issues such as clean water access, climate change, and other concerns involving health, the environment, education, ethics, and policy. The award was presented by Monica Devanas, a previous recipient of the Bennett Award, during the 2017 SENCER Summer Institute at Stony Brook University. Among her many achievements, Chamany became the first-ever endowed professor at Lang and the Mohn Family Professor of Natural Sciences and Mathematics at The New School. She earned her Ph.D. in Cell and molecular biology from the University of California Berkeley, serves on the editorial boards of the National Center for Case Study Teaching in Science and the journal Life Sciences Education, and was elected a SENCER Leadership Fellow in 2009.